Bad Breath could be one of the most uncomfortable circumstances in our lives. It is regarded as a publicly intolerable situation, takes a toll on our personality and self-confidence! Therefore, you may consider that cleaning and brushing are needed for oral hygiene. However, while it comes to oral care, there are some other issues involved in it. 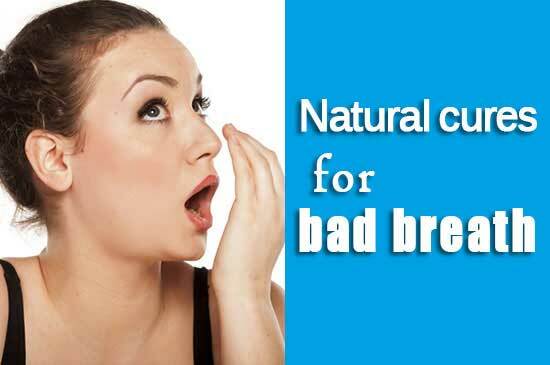 Before we mention some of the best natural cures for bad breath, let’s know the reasons for it? According to the Medical references, the main cause of bad breath is poor oral health. Your food selections and the unhealthy lifestyle are some other causes of bad breath. They not only occur in bad breath but also make you tend to other sicknesses. Eating the right foods are needed to throw away bad breath. Foods with the strong odor of garlic and onions. These foods are essential for our health and until they pass over the body, simply mouthwash and brushing teeth can decrease their strong smell. As basics of healthy oral habit are to brushing two times daily. Without flossing and brushing teeth daily can make your breath to be bad. Because staying food particles in the teeth can breed bacteria. Bacteria can give you bad breath, if they are not washed properly, they will damage your teeth and gums. Keep in mind, not only poor oral conditions give you bad breath, but also some health issues may reason to bad breath. A number of people suffer from constant bad breath problems. Even after take caring for their oral health; they cannot throw away their bad breath problems. A reason could be their gum problem. Plaque is the main cause of gum disease that formulates bacteria in the mouth and occurs to bad breath. Tooth decay, yeast infections, and dry mouth as well make bad breath according to other medical references, which also causes to as xerostomia. You may get dry mouth due to some drugs, salivary gland problems or if you breathe through the mouth rather than nostrils. Aside from these health conditions, some other illnesses like kidney or liver problems, bronchitis, sinus infections, diabetes, constant acid reflux, and postnasal drip cause bad breath. How to Get Rid of Bad Breath Naturally and Fast? 1. Fennel Seeds- There are some home remedies for bad breath. Fennel is one of them. It is known as a breath sweetener. If you feel you’re in bad breathe, chew a few fennel seeds. You will get refresh your breath instantly. 2. Green Plants- Try to have fresh basil, mint or parsley sprig. These natural herbs can be great home remedies for bad breath, as they neutralize odors. 3. Orange or Lemon Peel- They effectively help to throw away bad breath. Wash orange or lemon peels carefully, chew it for some time. The citric content in Orange or Lemon peels help to remove bad breath and stimulate salivary glands. 4. Aniseeds and Cloves- These natural ingredients contain antiseptic that fights against bacteria of bad breath. Chewing some aniseeds and cloves for sometimes can be your natural treatment for bad breath. 5. Brush and Floss- Do not forget to brush and floss two times daily. Select a good quality of fluoride toothpaste and mouthwash for brushing and flossing. 6. Check-Up You’re Oral Health Regularly- Go to your dentist on a regular basis. Even if you think that you are maintaining good oral hygiene, don’t forget to go to your dentist. 7. Drink lots of Water to Keep Yourself Hydrated- Water remains your salivary glands to be hydrated. So, drinking the adequate quantity of water daily will help you removing bad breath. After waking up in the morning, drink a glass of water and keep fresh up your breath. 8. Do you Wear a Dental plate? If you wear it, take out them before sleeping. After taking out, clean your mouth as it carries bacteria. 9. Scrape your Tongue- One more vital thing is that you should scrape your tongue every day. It will help to remove fungi, bacteria and dead cells from your tongue as because they can make to bad breath. 10. Eat Healthily- Eating healthy is the best way to remove more than a few health problems. 11. Green tea– A study has found that green tea decreases bad breadth due to having its antibacterial, polyphenols and antioxidants effects. Drink 3-5 cups of green tea or have a polyphenol EGCG supplement during the day. 12. Aloe Vera Mouthwash– Aloe Vera is a natural antibacterial and antifungal plant extract. a study has revealed that Aloe works as an effective chlorhexidine mouthwash to decrease plaque. It also increases the production of collagen, and improve mouth health. Make your own Aloe Vera mouthwash at home to fight bad breath. Just boil some water, then leave it to cool. Add Aloe Vera gel. You can include peppermint oil also. 13. Chewing Cinnamon Sticks-Cinnamon contains antimicrobial effects which are useful to decrease oral bacteria. Cinnamon is also believed to have digestive and breathing benefits, although more study is required. Chewing a Cinnamon stick may support bacterial diversity in the mouth. 14. Decrease Your Tension-Anxiety and tension can change your body’s odor. Because stress itself may change your body’s bacteria. Continual stress can decrease your ability to respond with others. A study conducted in mice proven that the microbiome can lose during chronic stress. Bad breath means your immune system is not working the way it should. Getting your stress under control is one more natural remedy for decreasing bad breath.